Under the Manhattan Bridge, there was a perfect lemon-meringue pie, with its curlicued peaks and ruffled crust untouched, nestled in a crazy conglomeration of wood and plastic debris as if the nest was made for it. Farther on, lying in the middle of a street two blocks from the river, was an enormous wooden railroad tie, with part of a Rubik’s Cube stuck in its crevice. In the quiet aftermath of Hurricane Sandy, these sights were common—objects hurled together and coerced into association. 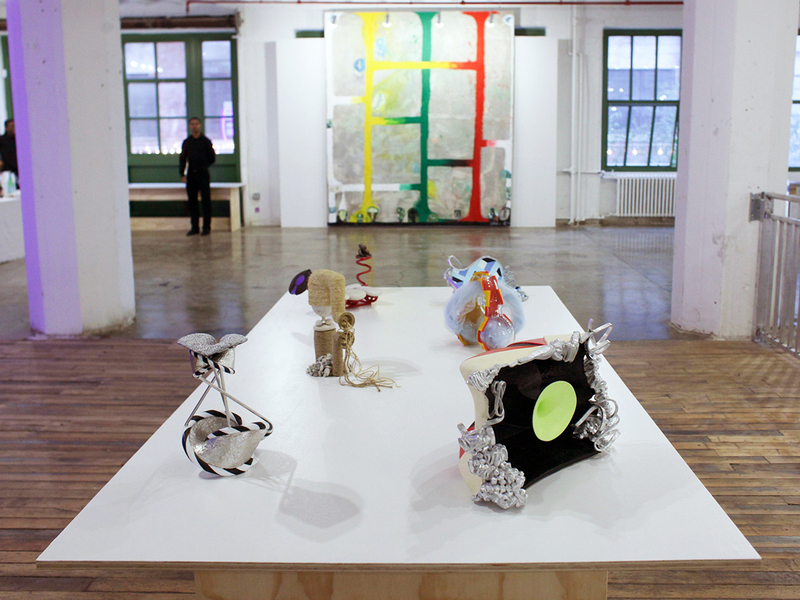 Chris Martin, “Red, Yellow, Green #1,” and John Newman, clockwise from top: “White stones and keyhole,” “Ask the fact for the form (after mask),” “Primaries retort,” “Danced mask small theatre,” “Black and white centerpiece,” “With a pile of stones.” Installation view. Photo by Brian Buckley. In Ask the fact for the form (aftermask), I took a couple of these ribbon-y pieces and balanced them on each other until they found their own locked-in structure […] as if it almost happened without me! Newman then “asked” this curly framework for a form, and it answered with a procedure. Stretching wire between the ribbons, he discovered a warped topology and then covered the surface with resin and Japanese paper. He painted a trompe l’oeil geometric image onto it, and by distorting the image, he added an illusion to an illusion. The result is a curious collision of disparate parts—silver frilly excretions surrounding a tile pattern both Roman and quantum—that have the authority of belonging together only after the fact. Absent any reference, these new works feel “scale-less.” In photographs, they could be as small as that lemon-meringue pie or as large as the wooden beam. In fact they are small and intimate; a little more than pie-size. John Newman, “Primaries’ Retort,” 2012. 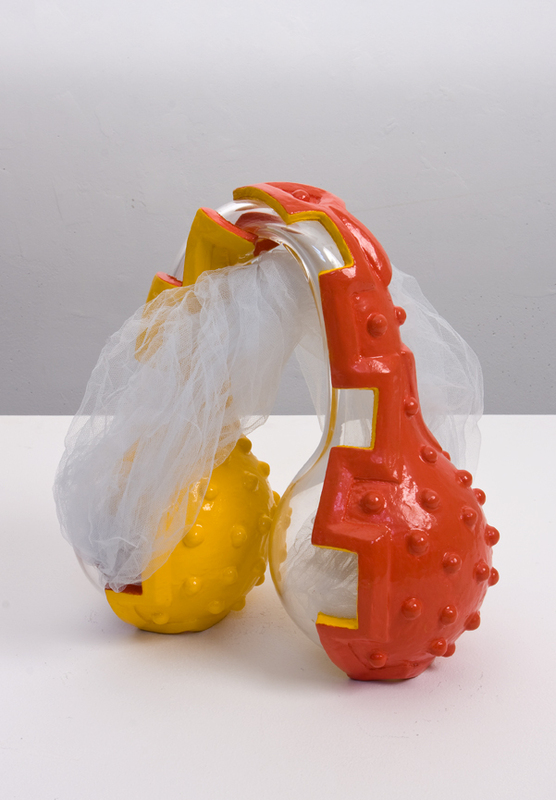 Blown glass, tulle, mutex, cast acrylic, enamel paint, 10 1/2 x 10 x 8 1/2″. Courtesy of the artist and Tibor de Nagy Gallery. Newman’s small sculptures aren’t abstractions or representations; they don’t stand for anything other than themselves, though they continually suggest. They aren’t models, though they seem to model a larger idea. The works have their own rationale, but one we haven’t met before. Perhaps it’s their small scale and exquisite craftsmanship that give you the urge to walk off with them (Newman likens them to scholar’s rocks or globes). They are surprisingly seductive and almost preposterous; things we really want in the world but couldn’t have imagined until we laid eyes on them.